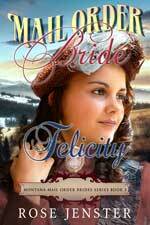 I am very happy to announce that Mail Order Bride Felicity was just released! It is Book 3 in the series but they are each stand alone novellas so you can read it first if you’d like. It is about Felicity, who works in a millinery shop and was crushed when a letter arrived telling her that the man she was engaged to married another woman. However, after much sadness, Felicity looks at some mail order bride ads and starts to write to a doctor in Montana. They have a good connection and the story shows the various issues they run into as their journey together unfolds. You can find it at Amazon CLICK HERE for .99 temporarily. I like to write about women who love to read and are intelligent, but also want a traditional family. Felicity is also special due to her interest in herbs and healing. Please let me know what you think. The other books in the series are Mail Order Bride Leah and Mail Order Bride Tess. In fact, there is a very sweet letter from Tess to Felicity in this new book that brought her to tears. Oh, I love Felicity. What a great story and will read Mail Order Husband Frank tomorrow as it is supposed to rain all day! Enjoy reading Mail Order Husband Frank and I am hoping book 5 will be out before Christmas. I am a college student and love these books! I find they relaxed me when I needed to take a study break this summer. I love learning about the west and another century. It is also very nice to not have books filled with angst or vampires or werewolves too! It is great to read something sweet . I have received some e-mails from other college students saying it’s nice to not read books full of high drama and superficial encounters! I hope you are enjoying a little break before the fall semester begins. I read Leah Friday and now am reading Mail Order Bride Tess today and I will also read Felicity. Thank you for this great series! I feel that their lives are very tenderly discussed and I hate to even get up for a bathroom break! Leah and Tess would want you to take a bathroom break when you need to! I appreciate your being captured by the books though! Thank you for letting me know and I do think book 4 will be out by end of August if all goes well. Some of the characters from previous books will also be getting together though I also want it to be a stand alone book too. What a treat to read this and when is book 4 going to be out? This was so beautiful. I am glad you enjoyed the book and it might take a few months but there will definitely be book 4 in the series! If you sign up for newsletter I’ll announce it when it’s out. Felicity was a great book and I really enjoyed her excitement about learning how herbs work too. It is too bad her grandmother didn’t get to teach her on this as she sounded like she knew a great deal. My grandma always had cool remedies like crushing up aspirin with water to create a salve for certain skin problems. What I liked about the book was how Felicity really changed from being self-centered and how she grew in patience. So glad this is a sweet clean read so I can tell friends and nieces to read it! Very engaging too. I’m a fan. Thank you so much and that is so wonderful that your grandmother had shown you some herbal remedies! I’m glad that you enjoyed Felicity’s change too and how she matured into a new person. It is also nice that you share this with family and others. Thank you!